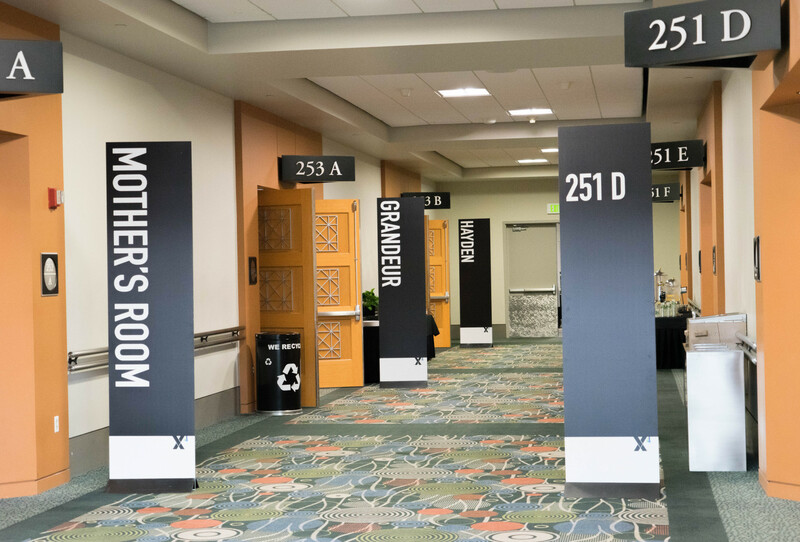 Anyone who has ever organized or been to an event knows the importance of wayfinding. What better way to direct attendees than laying down the path directly at their feet? Inside Sales saw that as the clear choice, and it looked great! They used one path to direct guests to the hotel registration while the other went to conference registration. The two paths, made of adhesive floor graphics, spanned across two separate floors traveling over 100 feet. Using direct paths like this is a great way to maintain traffic control and limit confusion for guests. 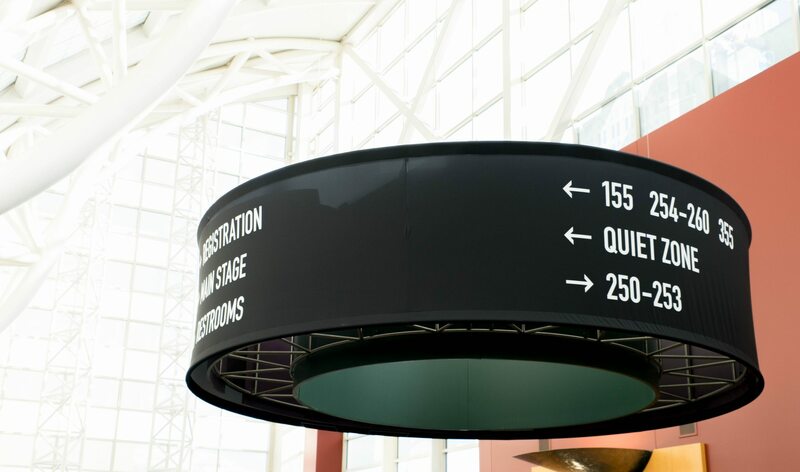 Of course, you need more than just wayfinding for a successful event, and Inside Sales knows it! They did a great job of making the hotel space theirs by utilizing column wraps, adhesive wall prints, Formz elements, and much more. Elements with a textured look can have a big impact on your displays, something eye-catching to add character to your booth or event. That’s where products like our falcon board come in handy. This rigid material still gives you a board-like look, even though it’s extremely lightweight. 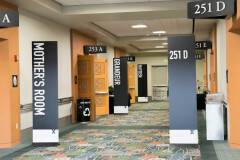 We have constructed many different elements out of this product from tradeshow booths to signs and wayfinding. We are even using it on our Exhibitor Booth this year! 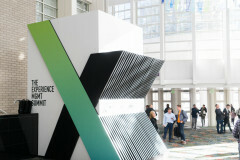 At CES by AgencyEA, we used falcon board to construct an outdoorsy, rustic feel for the event. The wayfinding at this event looks like it is built out of wood, however, it’s actually just printed falcon board. The directional arch is a mix between falcon board and Formz frames wrapped in tension fabric with a stone pattern. It is a very creative way to utilize our capabilities to establish the tone you are looking for at an event. 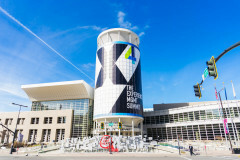 There are tons of convention centers across the United States. Each of them constantly being used for different types of events and shows. Fusion has been lucky enough to have been involved in events at dozens of convention centers across the nation! 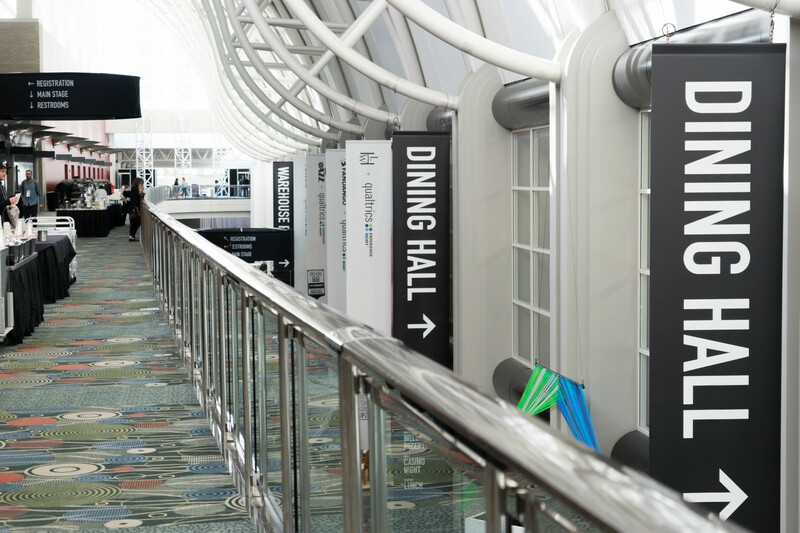 In doing so we have conducted countless site surveys and installations at these convention centers. This means that we know what solutions will work best for your event. So when you come to us for a project at a convention center, you are getting the help of seasoned experts who know exactly how to make your event pop! 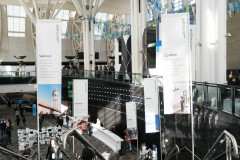 Below is a list of some of the more notable convention centers we have worked at. At all of these, we have done basic project management tasks like Site Surveys, Installations (with and without union labor), and Event Managment. 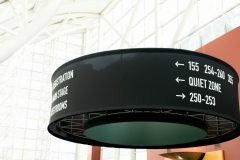 No matter what convention center you are occupying, we know our way around. No matter where you hold your event or show we will have the right solutions for you every time. When you work with the experts you will get the best results. You can see for yourself, below is a gallery full of events we have done at different convention centers! If you want to know more or inquire about an event you are holding feel free to reach out to us anytime! The Festival of Trees has become an annual holiday fundraiser for Intermountain Healthcare Children’s Hospital. A charity that has been around for almost 50 years that continually uses the goodwill of many giving people to help provide better care for children in medical need. Last year they raised $2.7 Million during this four-day event! We donated a tree this year themed after the colors that are so important to our work. Everything on and around the tree was made custom in our shop. The tree is covered in acrylic, Pantone themed lightboxes held together by glue. The fireplace was built in our Formz shop and covered in tension fabric. Even the stockings and ribbon around the tree were printed and sewn in our shop! If you want to learn more about The Festival of Trees, get tickets for the event, or get involved check out their website here! Being a preferred print partner for beMatrix, we can give you an edge when it comes to building and skinning booths. 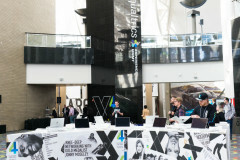 A great example is the booth featured below. We worked with Exhibit Potential to build this booth for their client Seychelle and it turned out great! You can see highlights of the beautiful booth below. We have an inventory of frames plus we can fit existing frames easily! Thanks to our experience with SEG graphics, we can fit any framing system, not just beMatrix. We have also worked with Aluvision, Agam, and Octanorm systems. We also have an extensive in-house frame inventory. This means that there is no need for you to ship your frames to us for fitting, it increases our quick turn times, and you can have peace of mind knowing that graphics will fit perfectly! When it comes to handling SEG Graphics of any kind nobody does it better. Our quality is second to none. You can see some great examples of SEG fit to beMatrix below. If you want to learn more about our SEG capabilities you can download our SEG brochure below. If you have any questions or want to discuss with an expert contact us today! Click here to download our SEG catalog! 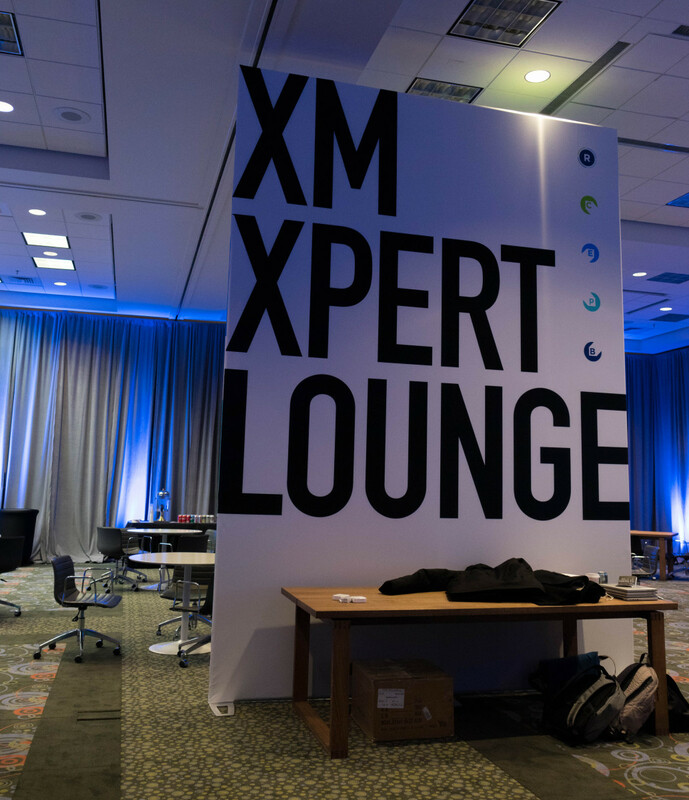 As a preferred print partner of beMatrix, we help skin a lot of really cool booths. A recent booth for Seychelle’s we worked on uses beMatrix frames and SEG graphics to create the look of a retail store – and it achieves it well! It pairs beautiful graphics with a smart design to put together a comfortable layout. Being inside the booth actually makes you feel more like you walked into a boutique store rather than a trade show booth. Complete with shelves full of beautiful shoes, artwork, and chairs and couches to complete the boutique look and feel. For a company that puts a value on comfort, they sure know how to achieve it, whether in shoes or in their booth! 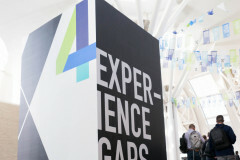 This is a great example of how you can use trade show booths to send a message from your company. Take a look at the booth in the gallery below, you almost can’t tell that the brick walls aren’t really brick, but are actually SEG graphics! Once in a while, we get the opportunity to try something new, just because we can. The new printing techniques we have used for EMS 2018 are a perfect example. The Experiential Marketing Show on May 14th is the perfect opportunity for us to show off some new uses we have for traditional products. We have used Dibond and Acrylic in unique ways that most people haven’t seen before. Like printing on black Dibond to give a tone-on-tone matte finish or blocking out certain areas of Acrylic panels so light only shines through where you want it to! We didn’t stop there though, we also have given Dibond a more aesthetic look. 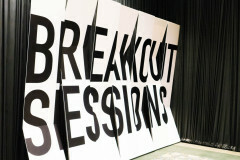 By cutting out letters and using them to create a dimensional look it becomes much more than a Dibond panel. Also, when you cut out a pattern in Dibond and layer it on top of the fabric, you have a clean look that can be used for anything from large lightboxes to even directional signs. Check out the pictures below and follow us on social media for updates throughout the show – like the complete booth and exclusive product highlights – not to mention cool project showcases. You can pick up valuable information from spending time on the show floor. We sat back and evaluated the shows we have attended the past few years and put together a list of the three things we have done right. 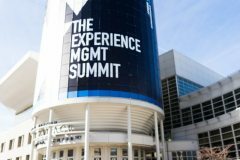 Based on client interaction and approval here are three things you need to do for your next trade show. People don’t want to be told something – they want to discover something. When a client heads to a trade show they are looking for the latest, most innovative and updated tech in their industry. It’s crucial to show up with something new and exciting to draw attention to your company. Often there are free advertising opportunities for new products that can greatly enhance traffic to your booth. We saw a huge swing in the success of our booth from 2017 to 2018 by providing a hands-on opportunity with our new products. In 2017 we didn’t have any hands-on displays and in 2018 we had at least 5 stations for interaction. More than just displaying the products, we designed the booth so that customers could touch, feel and try the new products for themselves. Nothing draws more attention to your booth than customers using the products, making comments and smiling. Give your customers the opportunity to experience your products for themselves and they quickly recruit their friends and colleagues. This is important especially if you are bringing a big team to the show. Create separate areas in your booth that allows several conversations to happen at the same time. We had a staff of 8+ at one point in a 20×20 space, and because we had several selling stations…we weren’t bumping into each other the entire time. We’ve found that the more time a potential client spends in our booth, the better. We had an unspoken rotation that allowed each sales rep to start the story wherever they were standing, and as we all rotated around the booth – we could give our potential customers the best experience. If you want to learn more about how you can better prepare for your next trade show don’t hesitate to ask us. 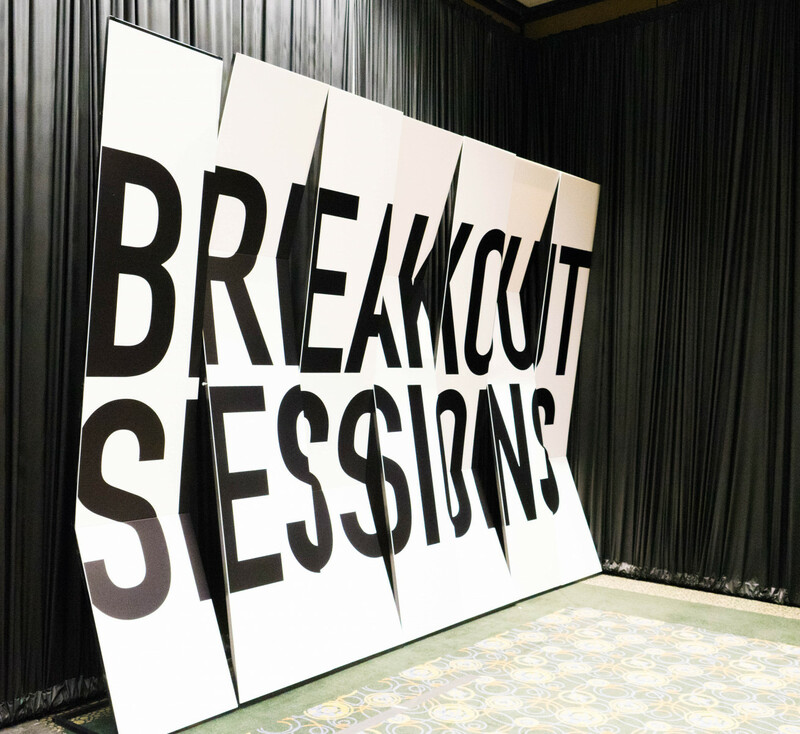 We would love to explore creative options for you to unlock your tradeshow potential! Occasionally, you will have activations that will only last one day – or less! 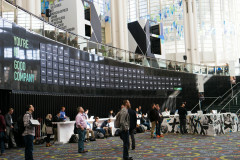 Activations like this can easily utilize our Flash Branding solutions! Flash branding is what we call branding for short term activations. This would be events that are a smaller scale or need to be up and down within the day. For example, DOMO has a ski day at the end of their DOMOPALOOZA at Snowbird Ski Resort. They only brand the resort for the day and by the end of it, everything is removed. 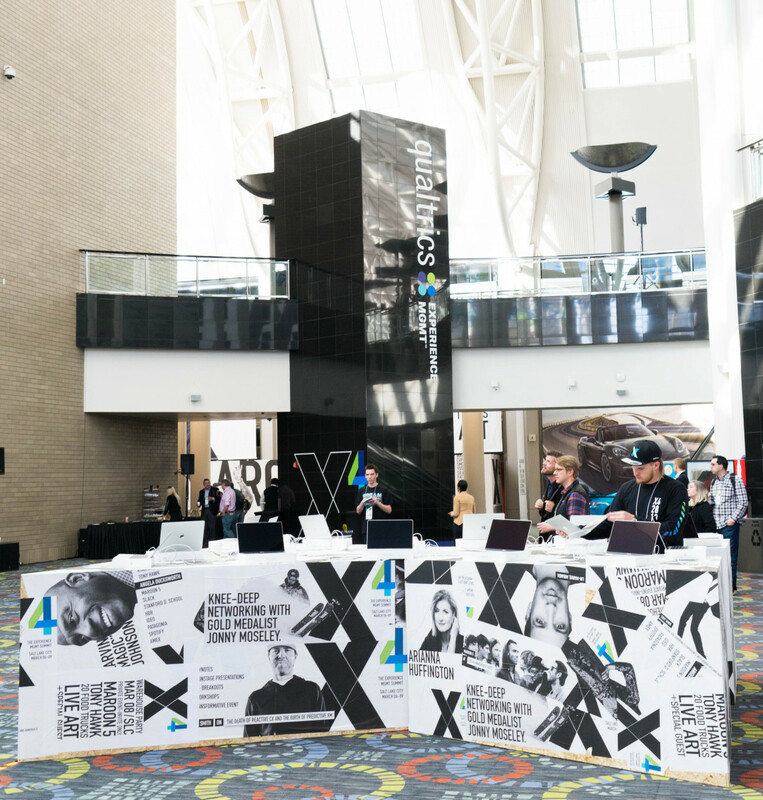 For this activation, we used feather flags, banners, window graphics, and column wraps to quickly and effectively brand the space for the day. 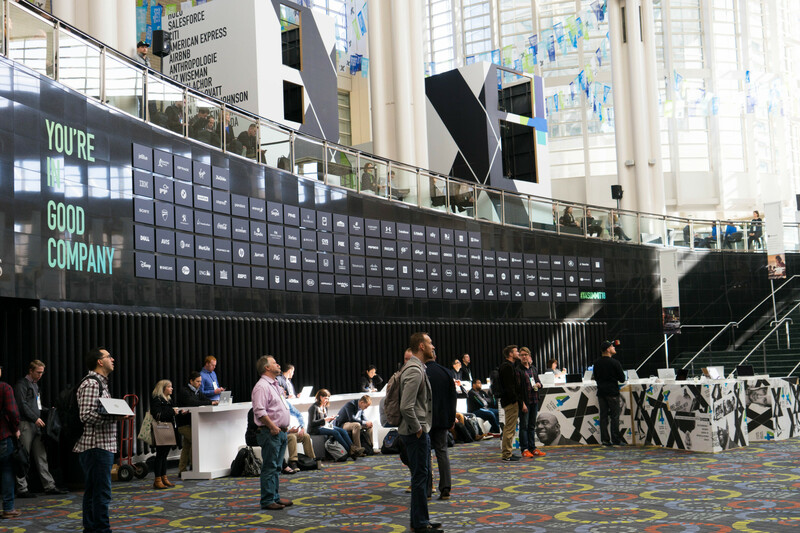 Flash Branding can change your single day event from plain to impressive. 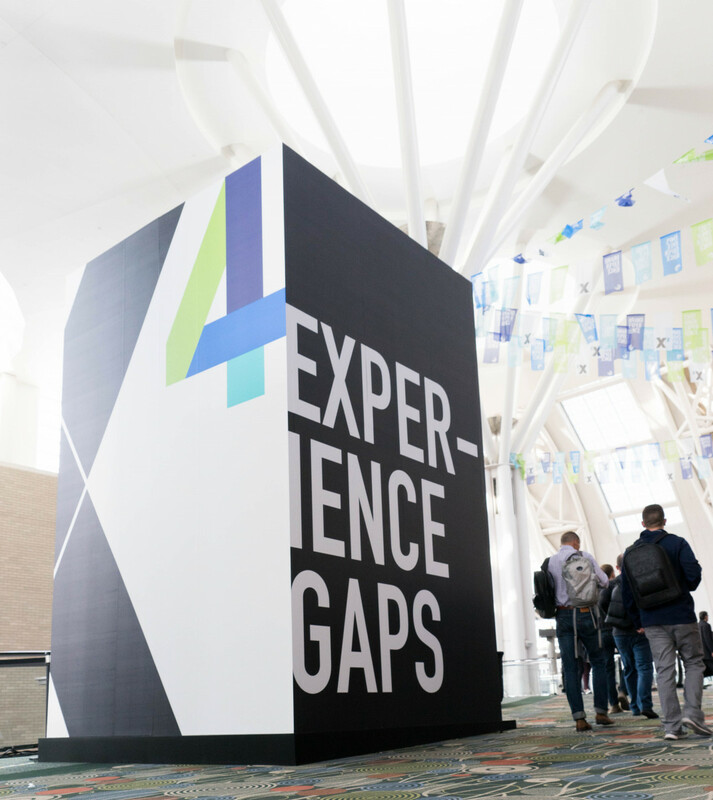 Thanks to high-quality and cost-effective graphics, you can impress your attendees and leave a lasting impression. 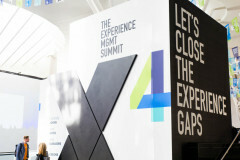 Look at how much of a difference some little but memorable Flash Branding Solutions can have on an event. 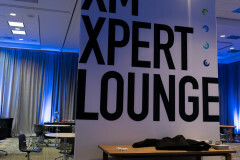 No matter what the event is or how long it is up for, branding is a necessity. It is always better to have it than not – even for just a day! 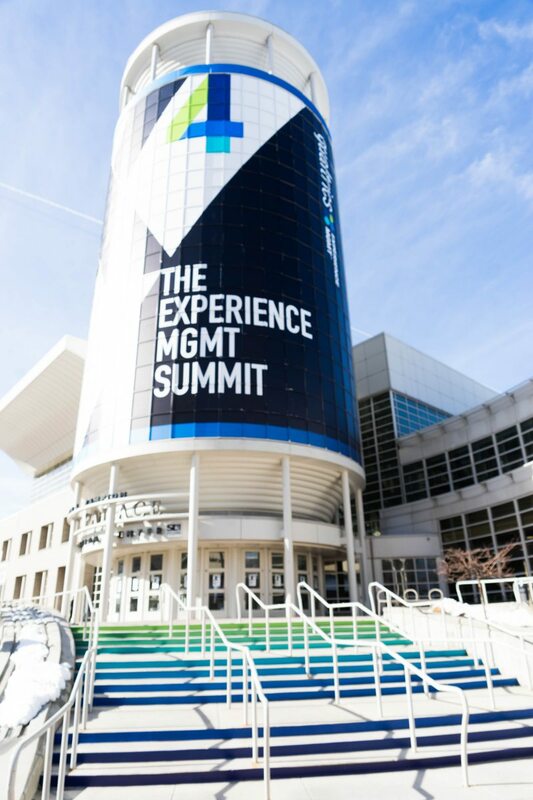 The latest Qualtrics event is in the books! It was an exciting project this year that turned out looking great. 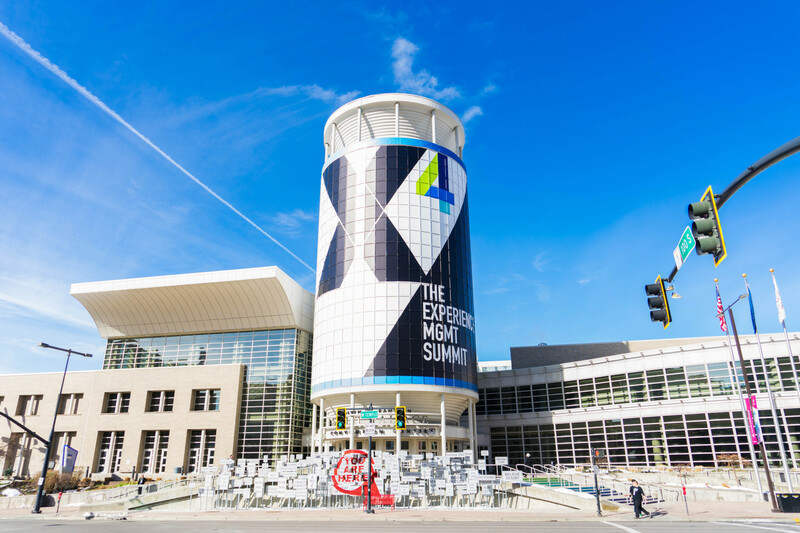 This year, Qualtrics held their event in a new venue – The Salt Palace. Like with any event, taking over a venue and making it your own can pose a real challenge. 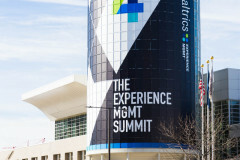 However, Qualtrics really had no issue branding the venue in a unique and memorable way (thanks to some awesome graphics!). Before walking in you were greeted with massive branding on the “Salt Shaker.” We’ve branded these large pillars before with window graphics, Qualtrics wanted to be different and instead of just doing the windows, they also had us put adhesive graphics on the mullions between the windows as well! Something no one else had done at this venue. The extra wrap gave a cohesive look to the branding of the salt shaker. This event was full of great branding decisions. 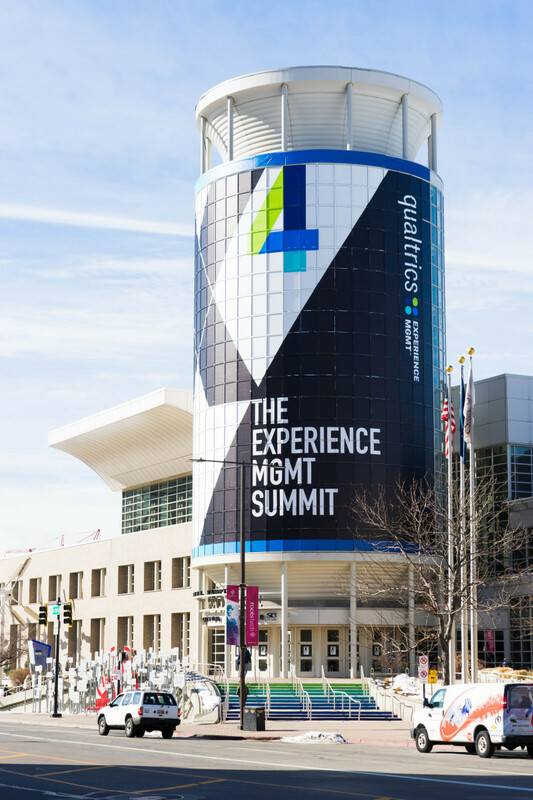 Qualtrics saw the opportunity to brand where others didn’t. For example, the hanging directional signs that they placed over the existing wayfinding at the venue. This allowed them to completely rename the rooms and areas in the building without confusing guests with the conflicting names the Salt Palace uses. 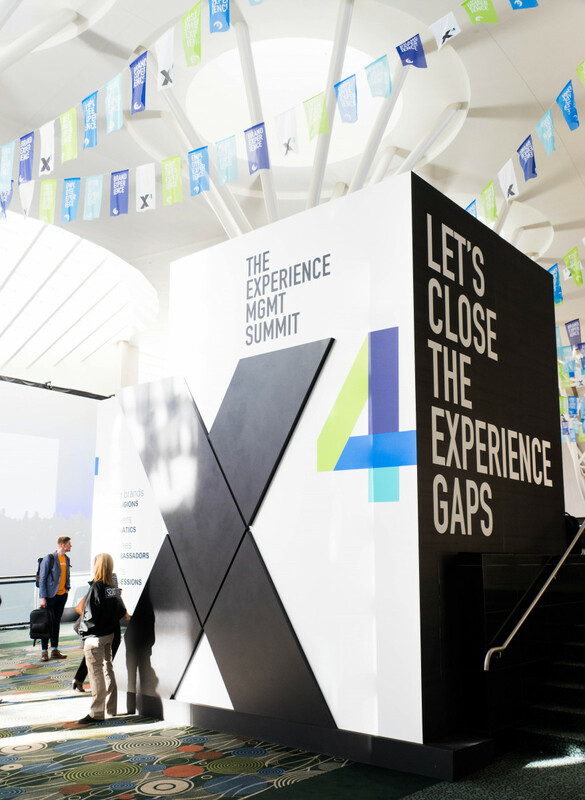 This gave Qualtrics the opportunity to completely control the event space. It’s really the little things that can make the difference when it comes to taking over a venue. Even our articulated walls helped give the rooms they occupied an extra POP. Elements that draw attention are always a great addition to any event. 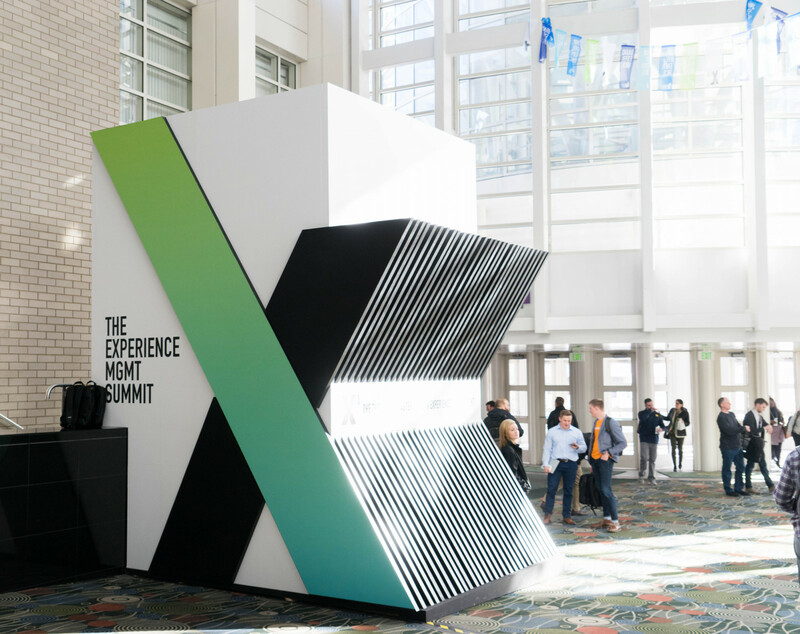 By the time our graphics had been installed, with the help of some scenic elements from our partner 3Sixty, the venue looked like it was made for Qualtrics. It is always fun to transform a venue like this, when it comes to events it’s what we do best. Our solutions can make your event unforgettable and we are always willing to push the limits and try new things! 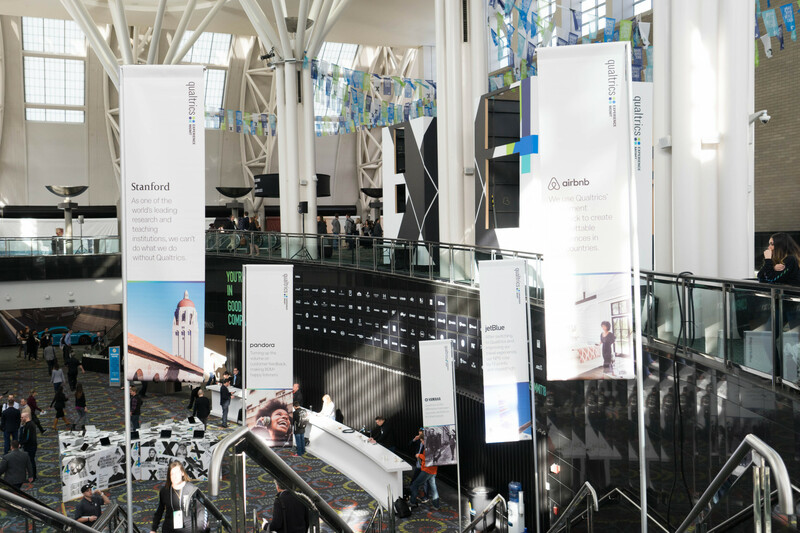 From stair riser graphics to giant window wraps, to wayfinding signs and hanging elements, we have your event branding needs covered. If you’ve got any questions about this event or one that you are planning reach out to us. We would love to talk about it and help you get whatever information you need!